Zibadianja Camp re-opened as a Premier-style camp in June 2008 with a beautiful new design and spectacular new location. National Geographic Adventure magazine in its November 2008 edition honored Zibadianja as one of the world's top 50 eco-lodges and Tattler Magazine recognized Zibadianja Camp as one of it's top 101 hotels and lodges anywhere. The camp inherited its name from the old Zibadianja Camp and is now known as Zarafa Camp, as few could pronounce Zibadianja correctly. Zarafa literally means "the beloved one" or "the lovely one". The true story of Zarafa is about a giraffe presented to Charles X of France in 1826 by the Viceroy of Egypt. Zarafa was a giraffe that inspired all who came to see her. The new Zarafa Camp does all that and more. Zarafa Camp is blessed with an extraordinary location in the eastern sector of the Selinda Reserve. The site is about 2km south-east from the old Zibadianja camp and is situated overlooking the vast savannas and floodplains of the Zibadianja Lagoon under cool and shady Jackalberry and Red Ivory forests. The uninterrupted views from every part of the camp over these productive floodplains is truly breathtaking. The enormous shady trees, the palm fringed savannahs, the high wildlife and birdlife concentrations out front characterize the camp as does the elevated views across the flood plain that forms an extension of Zibadianja Lagoon's southern shores. Zarafa Camp has four large and luxuriously appointed double or twin “marquis style” canvas tents that accommodate a maximum of 8 guests. It is the perfect camp for small groups who are looking for privacy combined with superb accommodation and great wildlife viewing (often directly from ones bed!). Each of the spacious tented rooms is expansive and is close on 100 square meters in size (or around 1000 square feet). Each one of the tents tent is positioned along the edge of the forests to take advantage of the spectacular view over the floodplains and savannas, while offering cool shade. Each tent comprises a spacious bedroom, an en-suite bathroom with copper bath & shower (as well as an additional outdoor shower for those who prefer the outdoors). The adjoining, comfortable lounge with its private pool rounds off the guest accommodation. A large shady veranda is standard as are overhead fans, flowing and seductive mosquito nets, and a beautiful handcrafted copper fireplace, strategically placed between the bathroom and bedroom for the winter months. The furniture has been designed and handcrafted by Don Young and his team specifically for Zarafa and is made from recycled ancient hardwoods. Continuing the marquis style of the accommodation, the main area is all under canvas with an emphasis on the view and the wildlife viewing out front. Furnished in the same ‘campaign’ style furniture, the main area evokes the wonderful and traditional safari ambiance. Lounge and dining facilities may be enjoyed under cover or on the full-length deck shaded by giant broadleaf trees. Complimentary camera equipment is available for the guests' use in each tent. The equipment includes backpack / camera bag, monopod, bean bags (on vehicle), Canon D40 camera, Canon 100-400L telephoto zoom lens, 28-135mm zoom lens, memory cards, etc. There is a free service to download all the images taken onto a disk so that guests can take their photos with them. Zarafa is currently one of the only luxury camps anywhere that is powered entirely from the sun. The in-house electricity generation system coupled with stringent use of recycled hardwoods and careful operating processes throughout the camp make this one of the "greenest" camps on the planet. Nothing has been spared to keep the carbon and emissions footprint to the minimum, yet all the appliances and facilities needed to run a top class operation are on site. All the electricity to run ice machines, the cold room for food and drinks, deep freezers, lighting and all the guest appliances is derived from Zarafa's solar farm at the back of the camp. Zarafa has 136 solar x 205 watt Sanyo solar panels that produce sufficient electricity during daylight hours that is stored in a large bank of deep cycle batteries that deliver 220 volts electricity 24 hours a day to the camp via a system of inverters. A side benefit of this solar system is that there is no disturbing background noise of a generator in camp. There is also a standby generator that will hopefully become a museum piece to be only used in emergency. Meals are generally table d’hôte and include a light breakfast at dawn, a hearty brunch on return from the morning activity, afternoon tea and snacks before the afternoon activity, rounded off with a sumptuous dinner in the evening. Special meals and requirements can be catered for on request. All local drinks, wines and beers are included in the tariff. One of the advantages of a small camp is that they can be flexible with meal times and can adjust meal times to suit wildlife sightings and individual guest's preferences. A small boutique shop stocks locally made goods and quality African artifacts. Payment can be by credit card (Visa and Master card only), travelers cheque or cash. A complimentary same day laundry service is offered. There is no set routine at Zarafa. The camp is small enough to be flexible. However, from experience, we recommend that wildlife activities are conducted when the wildlife is most active. Generally they explore the reserve in the early morning, late afternoon and at night. The midday siesta time can be spent at one of Zarafa's waterholes in an elevated hide. However, Zarafa Camp is located in the heart of a brilliant wildlife area and often the best wildlife viewing at midday could be from your room! Wildlife and nature drives are the primary activity and are conducted in open, 4x4 Toyota Landcruisers specifically adapted for these conditions. Walking is also encouraged and can either be a short walk from camp or as a full morning’s activity. Walks are led by licensed guides who are firearm experienced. A private vehicle and guide service is available, but this must be booked in advance to guarantee the service. Private vehicles and guides are on a first-come-first-served basis and are at extra cost. From 2009, the Selinda Walking Trails will not be operating as a scheduled departure walking safari as it has done over the past decade. The accommodation will only be available for guests staying at Selinda and Zibadianja / Zarafa camps who are looking for a night or two away from camp. A special area has been set aside in the northern reaches of the Selinda Reserve for these nights out. Following the trails and time-worn paths of elephant and antelope through riparian forest and open plains, guests have the privilege of experiencing Africa as our ancestors and the early explorers did - on foot. Wildlife in this area varies slightly from that at Selinda in that this camp is very close to the lagoon and the source of the Savute Channel. The view from camp is breathtaking and at the lagoon itself huge schools of hippo gather and crocodiles slide into the water as you approach scaring off water birds in great variety and abundance. While you are tucked into your bed at night, you will be lulled to sleep by the sounds of the lagoon's hippos. 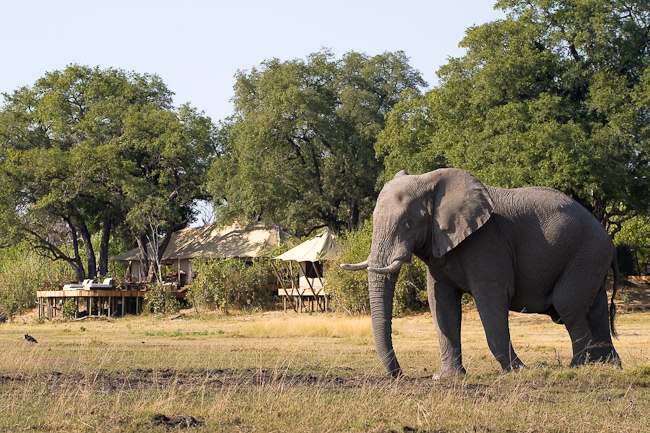 Elephant are common around Zarafa Camp, with densities during the dry season on a par with those of the Chobe National Park. At the peak of the dry winter months, they have counted around 9000 elephants in The Selinda Reserve. The lions that hunt hippos (the "surfing lions") are part of what has made this region famous. Their skill at hunting these huge animals is legendary. There is also the chance for the "spotted predators". The open plains are ideal habitat for cheetah while leopard viewing is rewarding when they are encountered. One of Africa's most endangered predators, the Wild Dog, is usually resident and the Selinda pack frequently dens in close proximity to the camp. Other common species include: buffalo (that sometimes congregate in huge herds numbering many thousand), giraffe, zebra, wildebeest, hippo, hyena, a variety of antelope including red lechwe, and the chance to spot a number of nocturnal species on Zarafa's night drives.